Roberta Salper, resident scholar at the Women’s Studies Research Center, Brandeis University, and author of one of the early women’s liberation anthologies, Female Liberation: History and Current Politics (Alfred Knopf, 1972) recently published two articles in Feminist Studies, “U.S. 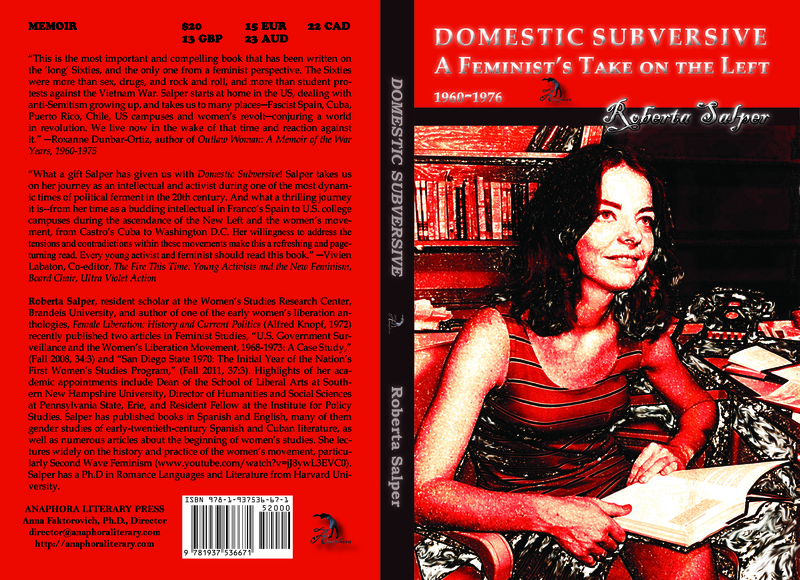 Government Surveillance and the Women’s Liberation Movement, 1968-1973: A Case Study,” (Fall 2008, volume 34, number 3) and “San Diego State 1970: The Initial Year of the Nation’s First Women’s Studies Program,” (Fall 2011, volume 37, number 3). Highlights of her academic appointments include dean of the School of Liberal Arts at Southern New Hampshire University, director of Humanities and Social Sciences at Pennsylvania State, Erie, and resident fellow at the Institute for Policy Studies. Roberta Salper has published books in Spanish and English, many of them gender studies of early-twentieth-century Spanish and Cuban literature, as well as numerous articles about the beginning of women’s studies. She lectures widely on the history and practice of the women’s movement, particularly Second Wave Feminism (www.youtube.com/watch?v=jJ8ywL3EVC0). Salper has a Ph.D in Romance Languages and Literature from Harvard University. Domestic Subversive: A Feminist’s Take on the Left 1960-1976 is an intimate, riveting memoir about the making of a political radical during the upheaval of the 1960s. It is both a personal journey and an inside look at political movements that changed the world. We see Salper first in fascist Spain, next in the heart of the New Left, the early Women’s Liberation Movement, and the founding of Women’s Studies. Finally she is engaged in third world liberation struggles in Cuba, Puerto Rico, Chile and the United States. As a Harvard-educated scholar, Roberta Salper was destined for a distinguished academic career. Instead she opted for a life of risk-taking, personally as well as professionally. Salper offers a unique look at marriage and family life within Spain’s fascist dictatorship before she decides to “go it alone” and in 1974 becomes a rare example of the single professional mother. Salper’s relentless search to define herself personally and politically is propelled by having experienced anti-Semitism in American suburban life in the 1950s. She sets out to explore the multiple meanings and functions of “outsider” and “insider” within her immediate social circles and in the greater political arena. What does it mean “to belong”? Roberta Salper became one of the pioneers of a new field of study that would be known as Women’s Studies. The tools of feminism were honed in the Women’s Caucus of the New University Conference (1968 to 1972). This until now little-studied socialist organization has had an impact on higher education that continues to be felt to this day. In 1970, she was the first full time faculty appointment in Women’s Studies in the first full-fledged Women’s Studies Department in the nation at San Diego State College (now University). Salper was part of the first generation of Second Wave feminists to recognize that, as educated women, their time had come. Doors were opening and they moved to take advantage of the moment.